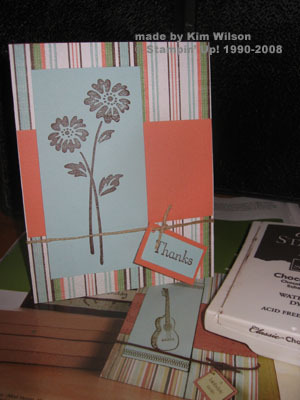 My inspiration card was the guitar card from the recent Stamp It magazine. I used the Live Your Dream stamp set and Afternoon Tea DP from the Occasions mini-catalog. If you wish to visit Andrea’s website for Stampin’ Up! demonstrators, I would appreciate you clicking on the Demo to Demo ad to your right. She is giving away a free class planner to anyone who requests it!